This term, we will be continuing to encourage the children to read with the whole school reading incentive. If your child reads four times a week at home, and this is recorded in their reading record with an adult's signature, then they will be in with a chance of winning a book. 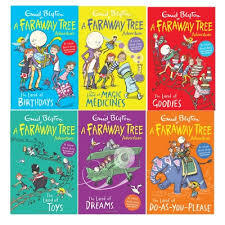 This term our focus author is Enid Blyton and the books up for grabs are from The Magic Faraway Tree Collection. We will focus this term on fractions and finding fractions of an amount. Later on, we will be collecting and presenting data. As all pupils are required to know their multiplication facts up to 12x12 by the end of year 4, this will also be a key focus for this term. As a school we use TTRS and we will be celebrating the children’s success in class – please practise at home – as this is the key to knowing these facts inside and out. It is truly amazing how much easier the children find maths when these key facts are learnt. There is a link to the TTRS website at the bottom of the page. Homework will be set each week on a Tuesday and will be due in the following Monday, it will mostly consist of an English or Maths activity lasting no longer than about 20 minutes. This will be in addition to reading, spelling practice and numberwork which children should partake in at home most days. Once or twice a term, we will also embrace opportunities to set more creative homework tasks – so get your glue and paint at the ready! While I would love all children to read daily, what is most important is that children develop a love of reading and choose to read for pleasure. As a school, we encourage children to read for 10-20 minutes on most days. We continue to use AR and I would like pupils to aim to take at least one quiz per week. Please come and have a chat if you have any questions linked to the AR scheme or of ways to engage your child with reading at home. We will be learning spelling daily in school, with a test once a week on a Friday. These words will be linked to the year 4 spelling patterns as well as the year 3/4 NC required word lists. Please help your children to practise their spellings at home everyday, it really does help! See link below for the year 3/4 spelling list. We will have PE twice a week on a Wednesday and Thursday. Please ensure that PE kit is in school every day! We are all looking forward to the term ahead and know that we will have a fantastic time. Please be assured that if you have any questions or concerns we will always be willing to listen and will do our best to ensure that your child is happy in school.